Send a message to the Japanese Foreign Minister, who is deciding his government's next steps. 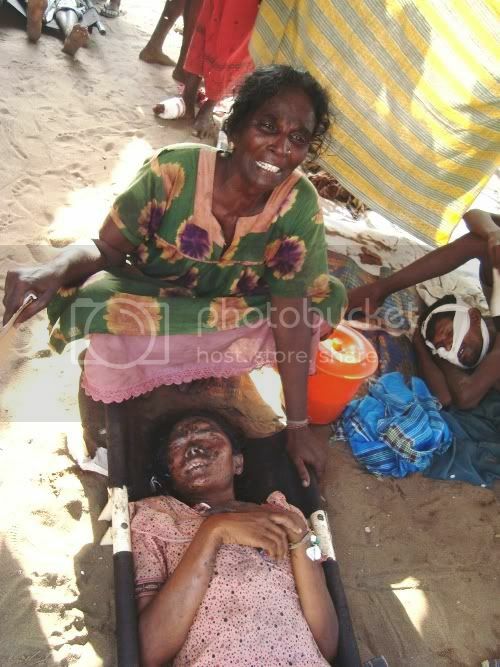 Massacre in Sri Lanka – do your part to stop the killing! A modern day bloodbath is unfolding on the small island of Sri Lanka, where a thousand civilians were reported killed over the weekend and tens of thousands of innocent people are literally at risk of being killed this week as government and rebel forces battle it out over the last small patch of rebel held territory. Now that the US has begun to increase its pressure, the key to stopping this humanitarian disaster lies with Sri Lanka’s largest donor and closest partner in the region — Japan. It has powerful political and economic influence over the Sri Lankan government and a swing vote at the UN Security Council, which up until now has turned a blind eye to this mounting catastrophe. As last weekend´s carnage testifies, every minute counts for the estimated 50,000 civilians still trapped inside the shrinking conflict zone and for those 200,000 more who are barely surviving in overcrowded camps. The International Committee of the Red Cross, which rarely makes public comment, called this conflict between the Sri Lankan government and the Tamil rebels, ‘nothing short of catastrophic’. Until now, the divided UN Security Council has abdicated their responsibility to protect Sri Lankans from war crimes and other atrocities. But in this conflict Japan cannot be ignored – it’s powerful voice could tip the balance and influence the conflict dynamics, saving lives in the short-term and promoting peace and development in the long run. As other donor nations increase the pressure behind the scenes this week, a truly global citizens’ outcry can further turn the heat on the Japanese government to use its leverage and push for a robust and concerted international action that stops the bloodshed and protect the Sri Lankan civilian population at risk. Thank you for sending your message today. ABOUT AVAAZ Avaaz.org is an independent, not-for-profit global campaigning organization that works to ensure that the views and values of the world’s people inform global decision-making. (Avaaz means “voice” in many languages.) Avaaz receives no money from governments or corporations, and is staffed by a global team based in Ottawa, London, Rio de Janeiro, New York, Buenos Aires, and Geneva. Call us at: +1 888 922 8229 or +55 21 2509 0368 Click here to learn more about our largest campaigns. Don’t forget to check out our Facebook and Myspace and Bebo pages!